Mobil 1 If you want total engine protection, excellent fuel economy and a product recommended for applications under warranty, you want Mobil 1®. 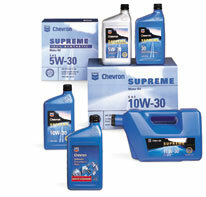 The world's leading synthetic motor oil, it features a proprietary. SuperSyn anti-wear technology that provides performance beyond conventional motor oils. Technology that allows Mobil 1 to exceed the toughest standards of Japanese, European and U.S. car builders -- and to provide exceptional protection against engine wear, under normal or even the most extreme conditions.